The northwest is one of most isolated and least populated parts of Australia. For the 80% of Australians who live in the southeast corner, it is the far side of our country and a region that maintains a sense of mystery. At over 3000km distance and bordered by the Indian Ocean, you can't get much further on continental Australia from where we live and still keep your feet dry. Geographically, there are many different regions in the northwest, ranging from tropical to desert. You could spend a year here and not get to know it all and we were limited to six weeks, so we had to choose carefully. Our sampling would be restricted to parts of the Kimberley, the Pilbara and the Coral Coast. The Kimberley Plateau is an ancient landscape of savannah woodlands, cut by rugged ranges and riverbeds that are virtually dry for half the year and drain the massive volumes of wet season rains for the rest of the year. Consequently, if you want to travel into the heart of the Kimberley, you do so in the dry season (May-November). 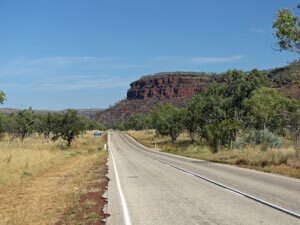 The plateau stretches across the north-western corner of Australia and is crossed by two roads, one sealed and one dirt. To really appreciate the Kimberley, you need to get onto the dirt and that means four-wheel drive. Further south, lies the even more ancient landscapes of the Pilbara. This is a region of rounded red grass-covered hills and deep gorges, so rich in iron that its massive mines are the major supplier for the insatiable factories of China, yet so immense that the mines vanish into aridly beautiful landscapes. To the west lies the coast, even more arid, yet having that special beauty of stark contrasts between sea and land. As well, here lies Ningaloo, a long fringing coral reef that is home to a host of marine birds and mammals and fish, from the smallest tropical species hiding in coral to the great whale shark cruising the deep blue depths beyond. This is a part of Australia that we have always wanted to visit and it has only taken the best part of six decades to do it, so join us in our 4WD campervan as we explore the landscapes, rivers, gorges and coastlines of the great northwest, by vehicle, canoe and (the only real way) on foot. The logical starting point to explore the Kimberley is Broome, the tourist mecca of the north-west. However, try to rent a bushcamper there and you face a "remote area" surcharge of $750. 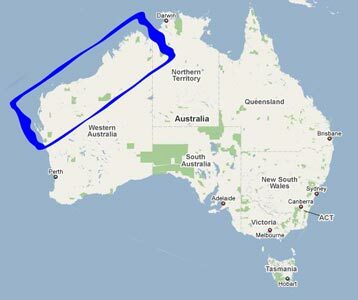 We discovered it was cheaper to rent in Darwin and drive one-way to Perth than do a circuit from Broome. Airfares were also much cheaper. 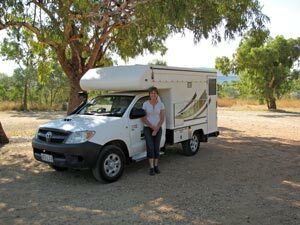 Thus we found ourselves picking up our 4WD bushcamper (a Toyota HiLux) on a hot May afternoon in Darwin (32°C) after a long flight from the cold of southern Australia (14°C); a minor thermal shock, but not enough to dent our enthusiasm . Armed with the Birgit Bradtke's excellent and always up-to-date e-guide to the Kimberley, we set off - heading 300km down the Stuart Highway, past the drifting smoke of many slowly burning fires. Traditional post-wet season burning by the local aboriginal people characterises this time of year in the north. It was good to get some distance behind us on the first day, even though we got into Katherine well after dark. The next morning we headed westward, crossing the flat savannah woodlands - the densely timbered grasslands a mosaic of burnt and unburnt vegetation, interspersed with the odd herd of brahmans in this, the land of the giant cattle station. 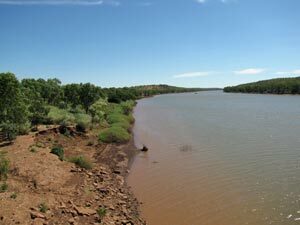 The monotony was broken by the mesas and red-rock escarpments of the Victoria River region where we stopped for lunch on the banks of this wide river - still running quite high but sluggish with the end of the wet season rains. No crocodiles were to be seen, but from all accounts plenty were lurking in its opaque waters. 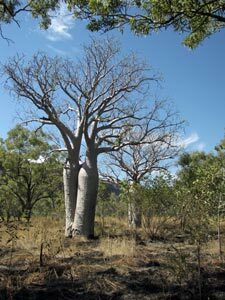 Pushing on westward, we passed Timber Creek and entered the land of the boab - the strange bare-leafed and bloated shapes of these iconic northern trees standing out from the surrounding thin-trunked acacias and eucalypts. Finally, we saw the silhouette of a low range in the distance - we were nearing the Keep River National Park. Although geopolitically Keep River is not part of the Kimberley, being just on the Northern Territory side of the border, geologically and biogeographically these ranges form its eastern rampant. So, having casually dropped the fact that I know a few big words, we had arrived. Keep River National Park was to be the first main stop of our adventures in the north-west of Australia.